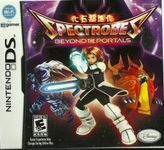 Gameplay in Beyond the Portals functions similarly to that of its predecessor. Players predominantly control Rallen in the field, although from time to time, they will be able to control Jeena to solve puzzles. Five of the original planets from the Nanairo system are available for exploration (excluding Himuro and Meido) and at certain points in the game, portals will open that will allow the player to play a mini-game in order to travel to different star systems. There are a total of ten planets and three portals spread out over four star systems. Source: Wikipedia, "Spectrobes: Beyond the Portals," available under the CC-BY-SA License.